Welcome to St. Andrew’s Dental Centre, your Aurora Dentist. For over 20 years, we have been providing Aurora residents with quality caring dentistry in the areas of preventive family dentistry, cosmetic and implant dentistry. We offer a comfortable, relaxed environment where patients of all ages feel welcomed and at home. Our flexible office hours can accommodate early morning and late evening appointments. We welcome most dental insurance plans, offer direct electronic insurance billing and flexible payment plans to help you get the dental treatment you need to restore or enhance your oral health. We do everything with a smile and a genuine concern for the health and well-being of our patients. We welcome the opportunity to be your oral health care provider and invite you to book a new patient exam or drop by for a tour of our modern, digital x-ray ready and comfortable dental office. We offer FREE parking and FREE Wi-Fi internet access. 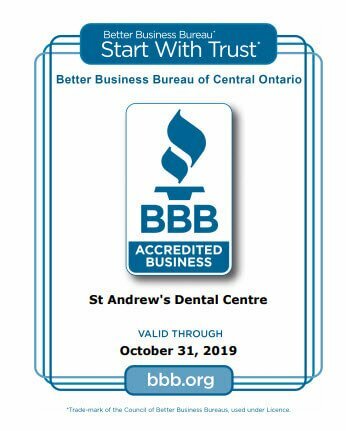 St. Andrew’s Dental Centre is conveniently located at 2 Orchard Heights Boulevard in Aurora, Ontario. Suite # 33 faces the North side plaza parking lot, behind Starbucks. In addition to English and Spanish we also speak: Russian, Hindi, Urdu, Punjabi, Tagalog and Italian for your convenience.